Music stars (real or imagined) and their various addictions and vices, have been fodder for films for many years. 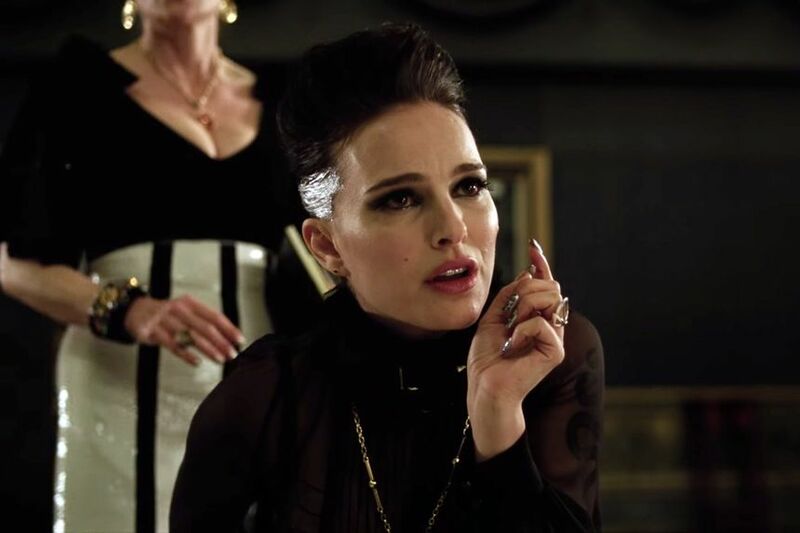 Brady Corbet's sophomore feature, Vox Lux, looks at the unusual beginnings and current troubles of mega-pop star Celeste, a stand-in for performers who seems to come out of nowhere, gain fame with arguably not much talent, and stay famous as much for what the press tabloids about them as their own artistic output. Combining voice-over narration (by Willen Dafoe) at key points to guide the viewer through the sign-posts of Celeste's experiences and the strange events of her life, with scenes of moments when Celeste must manage her own fractured body, mind and heart, while finding her strength and power within her career (both burgeoning and thriving), make for a disjointed yet compelling story. It's 1999, and at age 14, Celeste (Raffey Cassidy) survives a school shooting, though not without injury: a bullet to her neck means weeks of physical therapy and a lifetime of medication to help with constant pain. She and her sister Eleanor (Stacy Martin) write a song about Celeste's experience; the service at which she performs it is broadcast, where it is seen a big-time music manager (Jude Law). He quickly whisks Celeste away to further her career, joined by Eleanor as chaperone and confidente. So does Celeste actually have music talent, that just happened to be discovered because of tragedy? Or did this tragedy give her a fame that she doesn't deserve? This is an underlying question as she begins to navigate this world, with both the naivetee and the ambition that a modern teenager possesses. She knows that her sister is the real talent, at least in music, but it's Celeste who knows what it means to perform. Corbet throws the audience into this new experience as Celeste is thrown in, trying to make it seem like she knows what she's doing, but still without hte maturity to fully process everything, and so mistakes are made, and when she feels a betrayal by both her sister and her manager, Celeste takes control in places that maybe she shouldn't. Fast forward seventeeen years, and Celeste (now Natalie Portman) is a huge star, about to begin a tour with her new album, when a shooting on the other side of the world implicates her, leaving her to deal with the press, her now-teenage daughter (born of a brief encounter, and played by Cassidy), Eleanor, her manager, and her on-going problems with addiction. Now that Celeste is a big star, it would be easy to dismiss her and hate her for her bomastic nature, her decision to leave her daughter in the care of her sister (though Celeste provides all the money for the two to live), her difficult nature, how mean she can be to journalists and even restaurant workers, even if they deserve it. But we are reminded of how Celeste became a star, and more importantly, on how the tragic events of her teenage years continue to impact. She must make a statement when gunmen use the same masks she used in a video, when purpatrating a terrible crime. Her near-constant wearing of a band around her neck reminds her, and reminds us, that her injury is permanent, and when a callous journalist brings up the possible usage of ehr injury for attention, Celeste reminds him of exactly the pain she must daily endure, and how the medication she must take is the only thing that keeps her alive, and the thing that drives her mad. Corbett smartly casts an actual teenager to play teenage Celeste - as half the movie focuses on her rise, it has to be someone who can both look and feel the part of someone with too much thrust upon them. Cassidy (Tomorrowland, The Killing of a Sacred Deer) more than holds her own: we can see how she can both navigate this world as a media-saavy kid, but also be thrown by things that she cannot process, both at her age, and with the PTSD of the school shooting which she can only keep at bay for some of the time. Portman is the natural evolution of Celeste, one who has walked this strange line of managing her career while not always keeping the demons at play, particularly those of addiction (the necessary painkillers leading perhaps inevitably into alcohol and other drugs). Sporting a Staten Island accent, Portman is enthralling, both in the persona she acts for the waiting press, a vulnerable yetr loving mother to her daughter, a resentful and difficult sister, and a woman who must keep everything so tightly wrapped that everything, at one time or another, comes spilling out. Corbett doesn't really let his audience settle in, which is at least partly the point: he wants us to examine our own relationship with celebrities such as Celeste, those we love to praise and destroy at the same time (Especially women. As a society, we certainly give more leeway to men caught in cycles of addiction and egos that come with fame, while we hate women with similar personalities and problems. Fellow film critic Britt Hayes writes about this comparison in Vox Lux and A Star is Born in an excellent article on Slate). Corbett moves us between these seminal moments in Celeste's life, with the bridge of narration, for moments of reflection, and a final small story that might shed some light on how Celeste, despite arguably not being very talented, has stayed on top. Vox Lux is an antidote to other recent films on music stardom, eschewing the usual narrative route to give its audience both the joy and discomfort around the role of trauma in addiction and the pressure of fame. Vox Lux is currently in select cinemas in the USA and Canada.